Hello All! Another round of Mom Minutes is coming your way! My Mom, Earlene, has another great tip that I am passing onto all of you! Have you ever wanted to get perfectly formed cookies, like those that you see in the mall, but never seem to be able to duplicate at home? My mom found the answer to this problem awhile back. She bought a small ice cream scoop (the kind that you would use to scoop out small, round balls of sherbet, watermelon, etc.) that had a releasing mechanism on it. So, she scoops out the cookie dough, and squeezes the handle, and a perfectly round-shaped ball of dough is left on the cookie sheet. After awhile, she discovered that companies actually make scoops that are called "cookie scoops!" The above picture is almost duplicate to the one that she has at home. To locate one of these for your very own, you can browse Amazon (hint...use my Amazon gadget on the sidebar!) 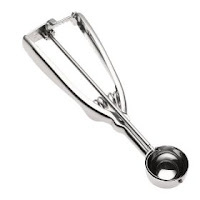 for cookie scoops. There are a lot of them, and you're sure to find one that you like! I personally like the red Wilson one. What do you think? After the gourmet feast? Well, as a wise woman, I took TWO Zantac before eating and then THREE Advil PM before bed. I'm at work but still fell like I'm in a coma! Mom rocks! Does she want another daughter? One that is say just slightly naughty. Have a great day! And hey, did you sign up for widget bucks because I got one referral? Sure, she'll take another naughty daugher..she already claims my twin sister...who, by the way, is waaaaaayyy naughtier than me (hi Teresa--love you! )....so, she said she'll take another. She says that you and her could make cinnamon rolls together! HA! I signed up for widget bucks, but I haven't heard anything back from them yet. Maybe I'll get an e-mail from them soon! Talking about my mother; have I ever told you what she did to me and my sisters? She named us Alisa (my name), Teresa (my twin) and Danesa (my little sis). Say those names 3 times really fast, and you'll see what I mean. It sounds like sa, sa, sa...everyone has always gotten us mixed up. I asked her one time, "why couldn't you have just named me Sue!" That is a good idea. When I make cookies I just scoop up the dough and then push it off with my finger and it just goes splat. I don't really want to touch it with my hands so that would be a good way to have a pleasing shape and not get my hands dirty!